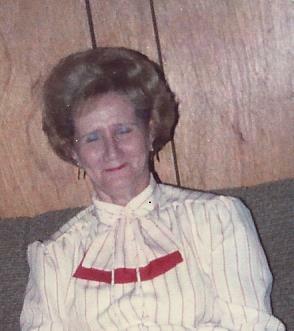 Ella Mae Dix Eggleston, 92, formerly of Keysville, VA; born October 14, 1924, went to be with her Heavenly Father on Saturday, July 1, 2017, at Radford Health & Rehab in Radford, VA. She was preceded in death by her parents, Alonza and Rosa West Dix; two brothers Ed and Ernest Dix; a sister, Alice Dix Rutledge; and the love of her life her husband, James Robert “Boonie” Eggleston. Ella is survived by her son, Robert Allen Eggleston and wife, Sarah; two special granddaughters, Celie and Hollie Mae Eggleston all of Radford, VA; one grandson, James Adam Eggleston; one great-grandson, Mason Hernandez both of Keysville, VA; three sisters, Mildred Foster of Keysville, VA, Bessie Raines of Roanoke, VA, and Margaret Harris of Chase City, VA; and several nieces and nephews. A graveside funeral service will be held at 2 p.m., Thursday, July 6, 2017, in Cool Springs Christian Church Cemetery, Keysville, VA. The family will receive friends at the Browning-Duffer Funeral Home in Keysville, VA, on Thursday, July 6, 2017, from 12:30 to 1:30 p.m. The Browning-Duffer Funeral Home in Keysville, VA is in charge of the arrangements. Our deepest sympathy and prayers are with you. May God bring you strength and comfort in the days ahead. So sorry for the loss of your love one. Our thoughts and prayers are with you all. May God bless and keep you during the lost of your mother, she was a wonderful lady and I loved her very much.